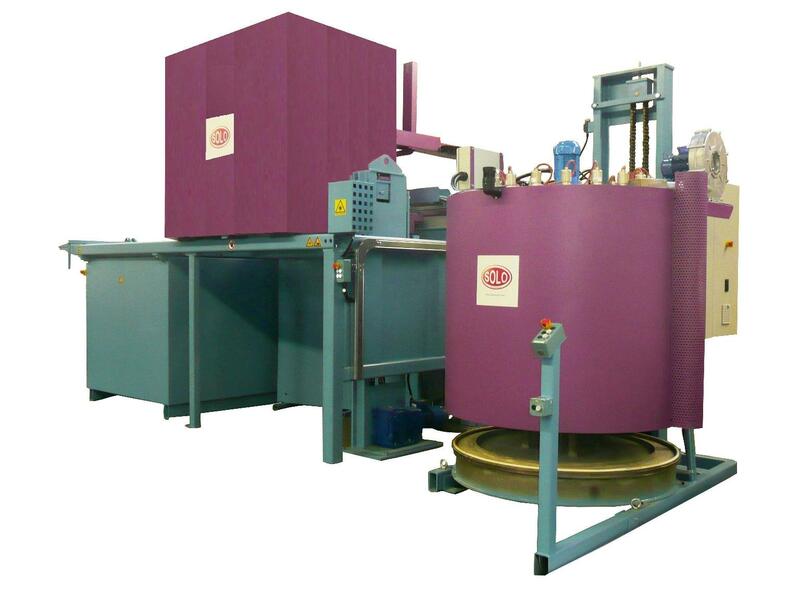 SOLO Swiss, builder of industrial controlled atmosphere furnaces since 1945, launched an automatic heat treatment line type Profitherm 300 for a manufacturer of hydraulic pumps to Taiwan. The SOLO Swiss line is designed for the heat treatment of hydraulic pumps. It is equipped with an austenitizing, carburizing and carbonitriding bell furnace, with a working temperature up to 950°C, a quenching oil tank max. 100°C, a tempering furnace under N2 atmosphere upto 550°C and an AXRON Swiss Technology process control and supervision www.axron.com. The useful loading dimensions are about 500 mm diameter, 700 mm height for a surface of 0,19 m2, a volume of 0.155 m3 and a maximum weight of a load of 300 kg. SOLO Swiss – www.soloswiss.com manufactures advanced industrial furnaces for the heat treatment of metals since 1945. SOLO Swiss offers controlled atmosphere furnaces, type batch furnaces, bell-type furnaces, retort furnaces, muffle furnaces, hardening furnaces, continuous furnaces, mesh belt furnaces, continuous furnaces with online quenching, used in variety of heat treatment processes (Carburizing, Hardening, Ecocarb®, Tempering, Annealing, Austempering, Nitriding, Brazing, Carbonitriding, Sintering, Nitrocarburising, Oxinitriding, Quenching…).